I’ve created a pinboard on Pinterest featuring previous Flashback Friday entries. I don’t have them all but I am adding as I can. I think it will be nice to have a visual reference of all the yummy recipes that have been shared and will make finding something that interested you once easier to find again. I am linking up one of my favorite side dishes in the world. 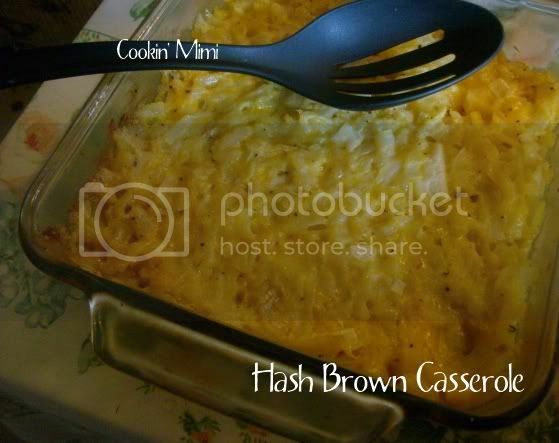 Hashbrown Casserole which is also known as Funeral Potatoes. Here are a couple of my favorites from last week. There were so many great recipes I had a hard time choosing. This Inside Out Peanut Butter Cup looks very similar to the Peanut Butter Fudge Torte from Golden Corral which is on my list to recreate at home. I’m going to have to try it and see. This Beefy Chile Relleno Bake looks amazing and would be a great busy night supper. Link back to one of the hosts somewhere in your post. A text link is fine or you can grab the button from the side bar. Link to your post and not your homepage. It helps people find your post later on. Visit and comment on the other blogs. Share the love.